It’s an unfortunate (and sad) fact, but I don’t know any one person who is happy with the way that they look. Whether they wish their stomach could be more toned, their thighs could be smaller or they could enlarge their biceps, not one of my friends or family could honestly say that they are happy overall with the way that their body looks. Some of these things can be changed (with a healthy lifestyle and daily exercise) but most people want a quick and easy fix, and often turn to dieting trends to meet their goals (even if these are only short-term). The dieting industry makes billions of dollars every year from people whose goal is to lose as much weight as possible in the least amount of time, and as a result, many dieting trends have plagued the masses in recent years. From the Atkins diet, to the Dukan diet, to the Fast (5:2) diet, to eating only certain foods (a great example is the Paleo diet), an aesthetically-conscious majority of the world have tried it. Another by-product of these dieting trends has been an increase in people relying on juice-based detox and cleansing programs to help them lose unwanted kilograms. Going by the theory that vegetable and fruit juices contain only natural (and therefore healthy) ingredients, many people have incorporated juices into their diets in the hope that this ‘healthy’ alternative will help in their weight loss goals. What many people don’t realise is that by extracting and drinking only the juice from these wonderful fruits and vegetables, people are depriving themselves of the fibre and other important nutrients that they would have gotten if they had simply eaten the food as it is. Unfortunately, every single juicing book I have picked up fails to relay this important fact to its readers (for obvious reasons), and Plenish is no exception. 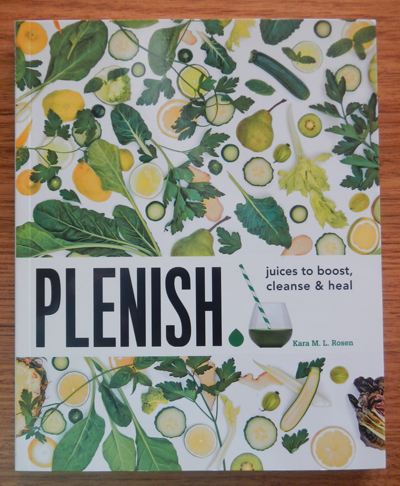 The start of the book seems promising, but quickly reverts to the same old formula- the author tells of the health troubles she once had, and the way that juicing helped get her wellbeing back on track. She enlists the aid of several experts (dieticians and naturopaths) in the writing of this book, and provides useful information about common ailments (such as high blood pressure, excess weight, insomnia and liver fatigue, among others). She explains each of these ailments and the best natural remedies (in the form of fruits, vegetables, grains and nuts) to help combat these problems. While it’s true that the vitamins and minerals that are contained in these foods are beneficial to our health, they would have far more impact if they were eaten whole. As this is a juicing book, the author instead gives juicing recipes that incorporate all of the best fruits and vegetables to ‘treat’ each health issue. After the juice recipe pages in the book, there is information on how to take on a cleansing program, and the healthy- mostly vegan- diet that you should stick to afterward to maintain any of the benefits you gleaned from the program. Deciding to give the juicing a go, my partner and I borrowed a juicer and bought a dozen or so different types of fruits and vegetables. We made two of the juices listed- the Thai Melon Brightener (cantaloupe-based) and the Beetbox (beetroot-based). While we had to admit that they tasted pretty good (if somewhat different) and recognised that a few of the other recipes might be just as taste-bud friendly, we still couldn’t grasp the concept of drinking only juice for 3-5 days straight in an effort to ‘cleanse’ our bodies. Knowing that there is little nutritional value (and that it can be quite an expensive venture when you take into account the cost of the ingredients), it just didn’t seem worth it. This book is only really useful if you want a condensed low-down on which are the best foods to eat when treating various health issues. While the recipes that we tried were quite tasty and wouldn’t be bad to drink every now and then, it would take quite a bit of dedication to follow this juicing cleanse to the end. I’m sure we’ll try and make some more of the juice recipes listed- there were a few that looked pretty appealing- but if we make them, it will be to supplement our regular diets, and not as an alternative to a balanced and healthy meal.